Light Detection And Ranging (Lidar) generates extremely accurate (vertical and horizontal) location information and has long been a desired product for the UMRS. Previously, the best publically available elevation data for the entire UMRS is 30 meter cells, though 10 meter/cell data can now be downloaded for many areas. In 2007, the U.S Army Corps of Engineers’ Upper Mississippi River Restoration Program (UMRR) partnered with the Iowa Department of Natural Resources (IDNR) to collect FEMA-grade, bluff-to-bluff lidar for Navigation Pools 8-24 of the UMRS. 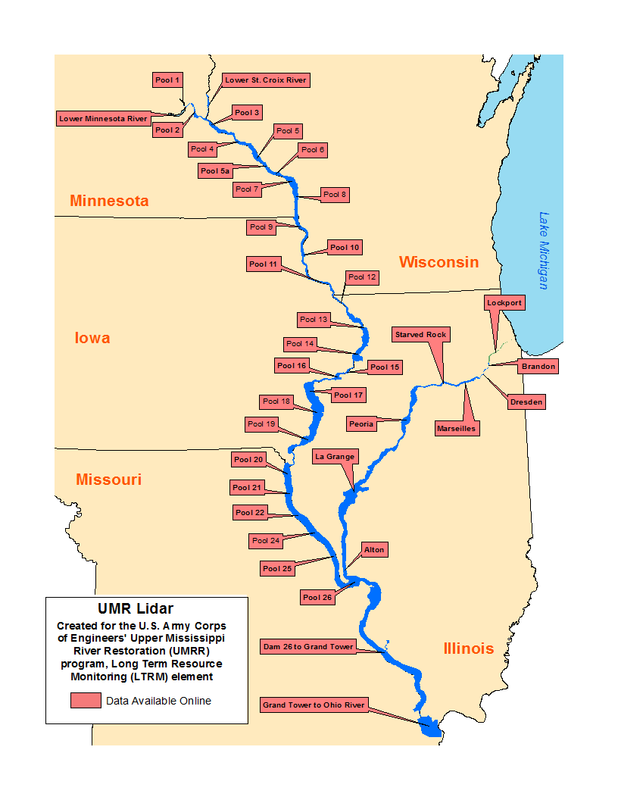 In 2009, with American Recovery and Reinvestment (ARRA) funds awarded to UMRR, the remaining lidar for the Upper Mississippi River, to the confluence with the Ohio River, and the Illinois River was contracted. Data acquisition was completed in 2011. Lidar data are remotely sensed, high-resolution elevation data collected by airplane. The Upper Midwest Environmental Sciences Center is processing these data to create Digital Elevation Models (DEMs), 0.5 meter contour lines, and pool-wide hillshade images. The collection and processing of these data are funded by the U.S. Army Corps of Engineers’ UMRR-EMP. For more information on Lidar and how it is processed, please see the Lidar Elevation Data page. Disclaimer: Tier 1 Lidar data available on this site are currently undergoing quality assurance testing by the U.S. Geological Survey (USGS). While this testing is underway, these data are being provided as-is, with no guarantee of accuracy. Tier 2 Lidar data have gone through quality assurance testing and have been approved for release by the USGS. Although Tier 2 data have been subjected to rigorous review and are substantially complete, the USGS reserves the right to revise these data pursuant to further analysis and review. Furthermore, Tier 1 and Tier 2 data are released on condition that neither the USGS nor the United States Government may be held liable for any damages resulting from their authorized or unauthorized use.